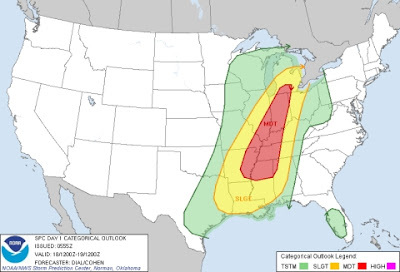 A moderate risk of severe weather is out today from Michigan south to Mississippi from a storm system that is organizing across the Plains and pushing east and northeast today. This storm system impacts us tomorrow evening and as of this morning there is no threat for organized severe weather locally -- dynamics don't support it. 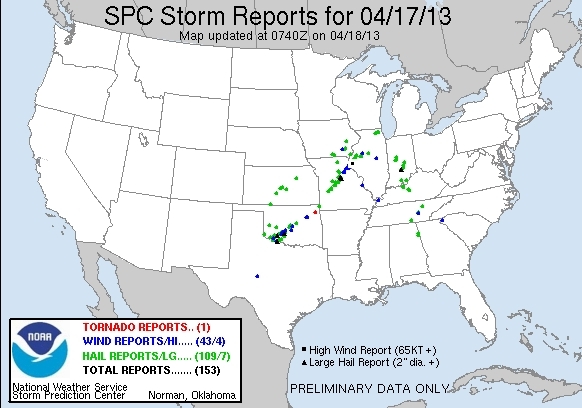 Today's threat is mostly wind and tornadic across the Midwest and Mississippi Valley -- yesterday produced over 100 reports of hail and wind across the US -- generally from Illinois southwest to Oklahoma. 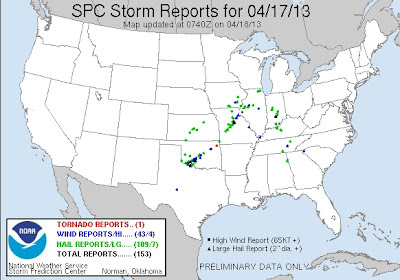 It was not as potent a severe outbreak yesterday as modeling had feared -- a moderate risk was out in these areas but only one tornado was reported as touching down in Oklahoma despite several tornado watches and favorable atmospheric conditions. Today offers similar favorable conditions on paper, as well as the threat of heavy rains to these areas. For us on Friday, heavier rainfall and some wind are the major threats. We are not under any slight or moderate risk level as of this morning and any isolated severe chances are placed out across Central Pennsylvania and Maryland to our west. The combination of frontal boundary timing (nighttime locally) and a less robust set of wind dynamics overhead reduce the potential for severe weather in general but with a moist southerly flow ahead of the front, the potential for heavy rains do exist locally. We can't completely rule it out but severe weather should be isolated in general tomorrow night with the front's passage through our region. We should be able to coax out a pretty nice Friday before the front approaches during the evening, with the bulk of precipitation set to pass through Philadelphia after 8 PM.